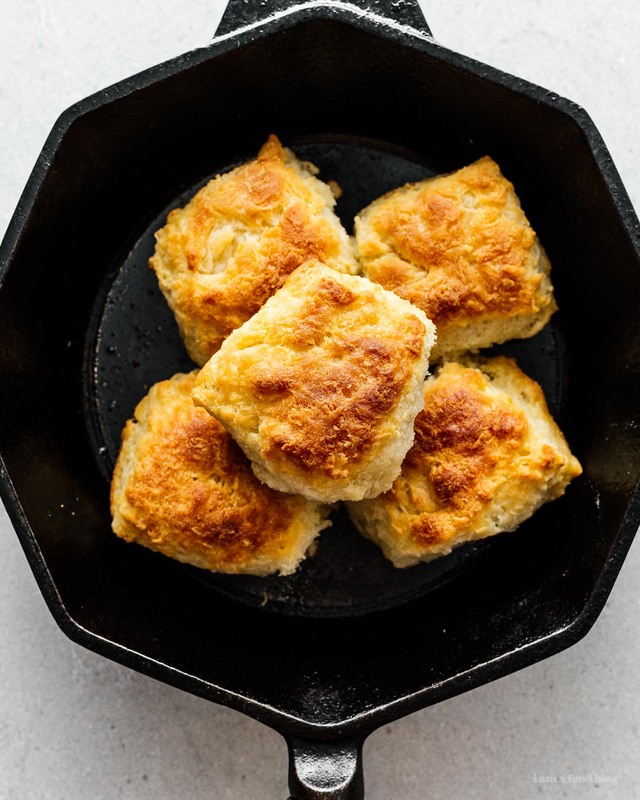 Make a small batch of tall, fluffy, buttery biscuits to have with breakfast, lunch, dinner, or as a snack. Perfect for one or two! Sometimes you just need a small batch of biscuits! 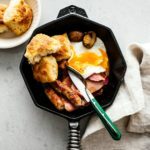 This small batch skillet buttermilk biscuit recipe makes 5 lil guys that are perfect for 2 people for breakfast, or for 5 small biscuits for breakfast throughout the week. Anyway, I was inspired and whipped up this small batch biscuit recipe. I was actually really lucky because I had exactly one cup of flour left! I used the food processor to whip these up – it was my first time using a food processor to do biscuits and they ended up light and airy and biscuity, but not layered. If you’re looking for a layered biscuit, this isn’t it. 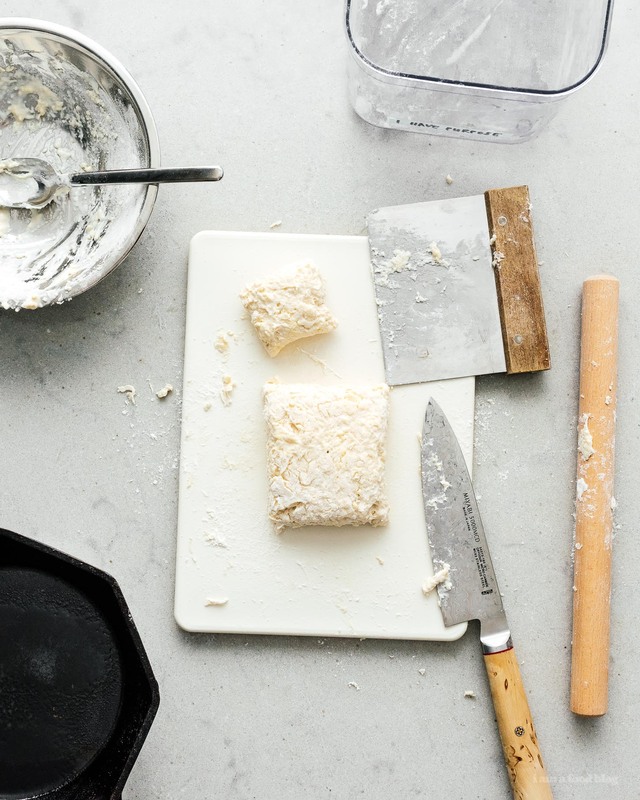 Layered biscuits need bigger, flatter slabs of butter and using a food processor gives you more smaller, more evenly distributed pockets of butter. I’m really happy with how these came out. I just had one (I’m writing this two days later) and it was just as good as when it came out of the oven. I popped it in the oven to give it a bit of warmth and a quick toast and it was buttery and crispy and soft and all kinds of good. PS – The story about the cafe: Mike and I went to a super hipster, super busy cafe that was a seat yourself kind of situation. We wanted to eat a bunch of things but didn’t want to stalk/stand next to tables just empty handed so we grabbed a coffee and beer and hung out near the tables casually waiting for people to leave. We were standing there for a good twenty minutes, just chatting, when a table started gathering up their things to leave. We hung back, thinking that we would grab their table after they were done, but all of a sudden, a women looked at us and at them, then walked past us towards them to ask if they were leaving. They said yes, of course, and then she just sat down. I was so annoyed because…I don’t know, it was pretty clear that we were waiting for a table, but kind of try to not be those annoying people who are standing right next to your table while you’re trying to enjoy yourself. Anyway, we got a table 10 minutes later, but I was totally miffed because, hello coffee shop etiquette?!? Okay, end rant. 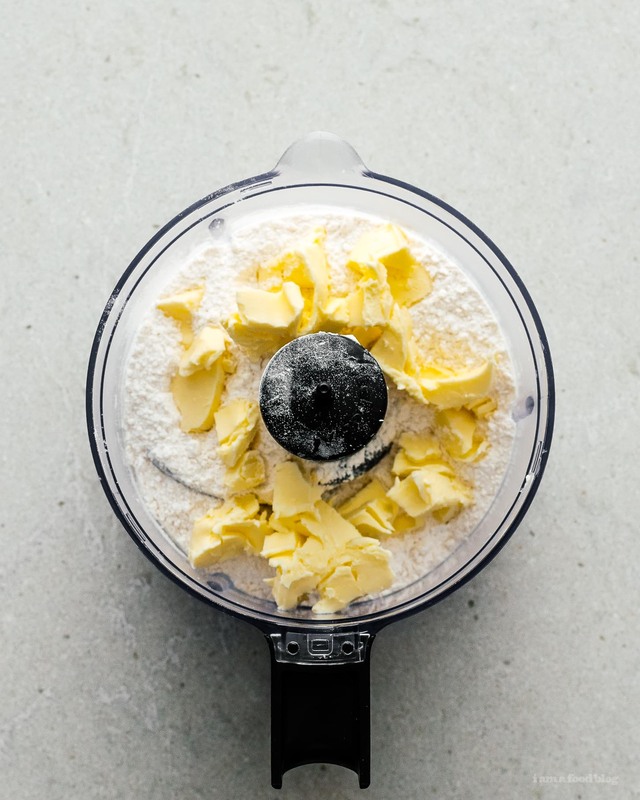 In a food processor, blitz together the flour, baking powder, salt, baking soda, and butter until it resembles coarse crumbs. Add the buttermilk and mix until it just comes together. Turn out onto a floured board and fold until everything comes together as a dough. Shape in a rough square then cut into 4. Or, you can trim the sides and then form one extra biscuit from the trimmings. Brush the tops with butter. Place in a lightly buttered/oiled cast iron pan or on a baking sheet and bake until golden brown on top, 15-18 minutes. Remove and let cool slightly before enjoying. Keep them on the counter in a container if you don’t finish them right away. If they’re going to last longer than 2 days, pop them in the fridge, then lightly toast to revive. Can’t wait to make this recipe. My husband and I love biscuits, but have been eating the freezer biscuits since we’re empty nesters. Need a small batch biscuit recipe. 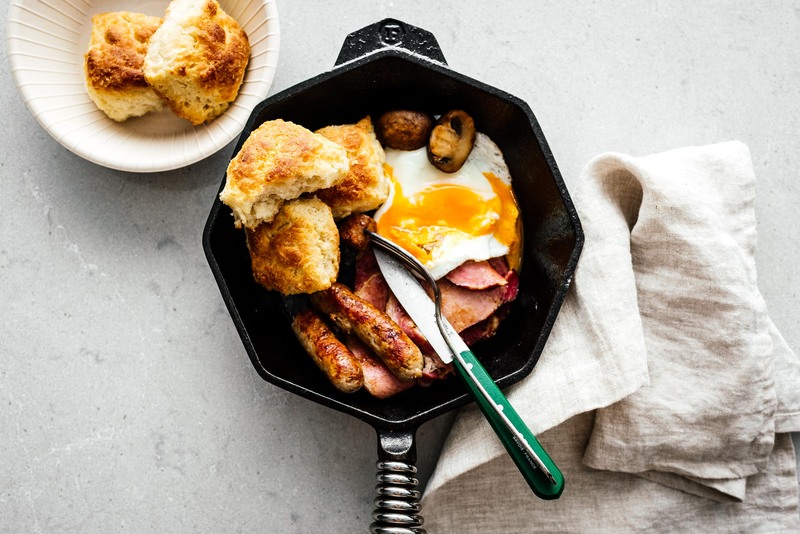 I have to ask…where can I get one of your fantastic octagonal cast iron skillets? Have to have one…beautiful! Great smaller size for cooking for 2. These look great. Making bread type items always seems so complicated. This looks relatively simple.